I understand why many people don’t enjoy watching a sport that can be as low-scoring as soccer can be, but there is really something special about seeing two teams battle it out for 90 minutes and leave the field as equals. It might be unsatisfying from a spectator’s standpoint (as it’s only natural to want some sort of resolution), but I love watching defensive struggles. I guess that’s why I’ve always enjoyed playing soccer games, which have never been particularly high scoring affairs since I have a shooting accuracy worse than my kill-death ratio in Call of Duty. Despite all the time I’ve spent with soccer games over the years, I’ve never been great at Konami’s Pro Soccer Evolution games. Electronic Arts’ FIFA series has always felt more welcoming to me, so I typically stuck with that as my main way to play digital soccer. That no longer has to be the case as PES feels a lot more user-friendly from past years. A large part of this is just how the game presents itself to players. After a minute of booting up Pro Evolution Soccer 2017, I was prompted to go into the game’s excellent skills training mode. Very similar to FIFA‘s own training mode, the skills trainer teaches players the basics (and some advanced techniques) by setting up score-based mini-games. This is far more effective than looking at a command list and wondering what a certain type of kick does, as it also teaches the player when they would want to use techniques. Why does this screen still exist in 2016? After a few short minutes, I had an array of moves at my disposal. I now knew how to make my teammates apply pressure on ball carriers, how to set up a quick one-two pass, and was curving my shots on purpose. As someone who always stuck to the absolute basics in past PES games, this was really a revelatory experience for me. The only area that isn’t really explained clearly is the advanced dribbling maneuvers or “skill controls” as the game calls it. Instead of simply using the right analog stick (and a button to modify moves) like in FIFA, PES has an unwieldy control scheme that had me using both analog sticks, clicking in the right stick and holding in triggers. It probably makes sense to long-time players, but I was left lost due to the poor introduction. That’s fine, though. I don’t need to embarrass my foes by breaking their ankles, and I had more than enough moves to master. What is really impressive about Pro Evolution Soccer 2017 is that after teaching players everything they need to know in order to succeed, they also have difficulty options that allow players to get comfortable playing. There are six different difficulties and while I started out on the game’s amateur mode to get my bearings, I soon was in regular as the game wasn’t offering much of a challenge. After competitive matches, but ones that saw me rarely losing, I then graduated to the game’s fourth level – professional – which is the right mixture of challenge for me. I never feel uncompetitive in matches, but I still have to earn each victory. It’s great that Konami included so many different levels, as it lets players learn without being thrown in the deep end immediately. Pro Evolution Soccer has a wide variety of modes, although none are really new from last year’s installment. That’s fine, as they are more than enough and I’d rather see Konami build on what already works than put out a half-baked one simply to have a bullet point for marketing. The real star of the selection is once again the game’s Master League mode, which is the PES equivalent to a franchise mode. This in-depth mode put me in the shoes of a young coach (named Harambe, of course), and I had to deal with multiple budgets, negotiate player transfers, and send off scouts. Oh, and I had to play football too. That may seem like a lot to handle all at once (which it is), but Konami does a fantastic job of introducing all of these systems to the player. It quickly walked me through how to make loan offers, and after a few matches I was already improving my team. Master League might just be the best franchise mode I’ve ever played in a sports game. The amount of stats that is kept on each player (including details such as if they have hit their peak yet or not) is staggering, and it really helped me make correct decisions off the field. It was better for me to get a talented but old player on loan, while keeping the rest of my money free to outright purchase a young prospect. This led to a really satisfying gameplay loop, and I found myself simulating a lot of games to focus purely on the managerial side. 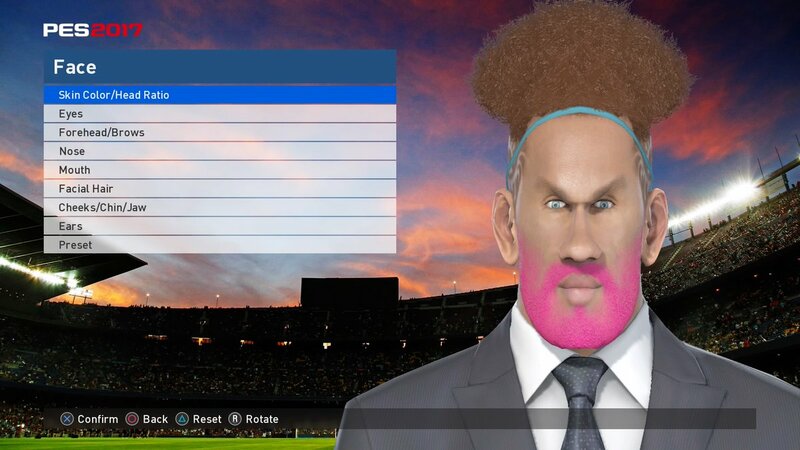 Other modes include “Become a Legend,” which has the player experiencing the entire career of their create-a-player monstrosity (you can make some really ugly create-a-players, as you can see in my screenshots). I had some fun with the mode, but ultimately I preferred playing as a full team as opposed to just one position. There is also naturally a lot of sitting on the bench early on, while you wait to get substituted in. So it doesn’t really make the greatest first impression. The other big mode is” myClub,” which is PES‘ answer to FIFA‘s wildly popular Ultimate Team mode. One nice thing about the mode, furthering the game’s focus on accessible gameplay, is that tutorials are available to show new players how to obtain new (temporary) players for their squads, and how to spend the in-game currency (which is earned by completing tasks in other modes and playing well) to acquire managers. Sadly, I’ve never really found any interest in these types of modes, and this did nothing to change that. I still would rather play something like Master League than worry about players with five-game contracts, but at least PES has something for everyone. As far as the online play goes, players can join in on huge competitions that can hold up to 1,000 players) and play simple ranked and player matches. I was able to get into several relatively lag-free matches against other players. Occasionally, the game would start to feel choppy, but it would clear up after a second or so. The netcode isn’t perfect, but I definitely felt like every online match was fair. I truly think Pro Evolution Soccer 2017 is a fantastic sports game, but I do have a few small grievances. 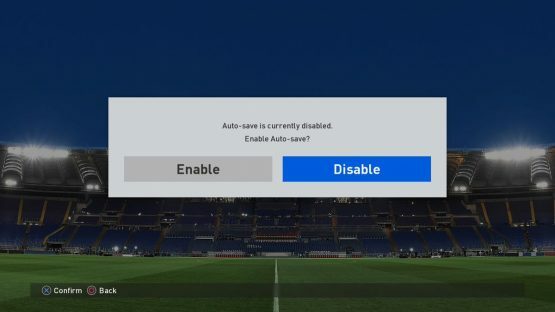 Continuing my amazing ability to lose hours of progress in games I’m reviewing, I have to note that the game does not have auto-save enabled by default. So, if you don’t want to lose all of your Become a Legend progress because you thought it would be funny to make the soundtrack only play Justin Bieber’s “Where Are Ü Now,” then make sure to toggle auto-save on in the settings. Also, despite the game touting “natural player movement” the game sometimes has some wacky animations. I found it more charming than an actual issue, but those who take their simulations super seriously might get annoyed by these moments. For example, whenever the player slows down while dribbling the ball the player will continue to walk in place even if they are only moving a single centimeter in five steps. It made me laugh just about every time I saw it, but I’m also pretty easily entertained. It’s also worth noting that PES is still lacking plenty of team licenses, so instead of Manchester United I played as the Manchester Red. As someone who doesn’t really follow European league play I wasn’t really bothered by this omission, but some of the fake names are really awful like West Midlands Stripes. Although, I guess when real clubs are named BV Borussia 09 Dortmund, I’ll settle for the fake ones. Konami did manage to secure a few big licenses, though, such as Arsenal and FC Barcelona. Konami might not be involved in video games for much longer, but they can still put out one heck of a football sim. Pro Evolution Soccer 2017‘s Master League is one of the best career modes I’ve ever played in a sports game, and it’s backed up by incredibly solid gameplay. Once you look at the disappointing lack of team licenses, players will find one of the most rewarding sports games available. Review code for Pro Evolution Soccer 17 provided by publisher. Reviewed on PlayStation 4. For more information on scoring, please read our Review Policy here.